Almost 100 people were killed across Syria on Friday amid intense bombing on opposition-held suburbs of Damascus, according to pro-opposition activists. The Local Coordination Committees documented 98 deaths, including 17 children and 10 women. More than 50 of those killed were in the Damascus suburbs, including ‎Kafrbatna‬ and ‪Jisreen‬. Another 18 people died in ‎Daraa Province to the south of Damascus‬, and 18 were killed in ‎Homs‬ Province in central Syria. The Syrian military has besieged and bombarded the East Ghouta area near the capital for years. Hundreds of civilians were killed this summer and autumn in a single town — Douma, the base of the leading rebel faction Jaish al-Islam. 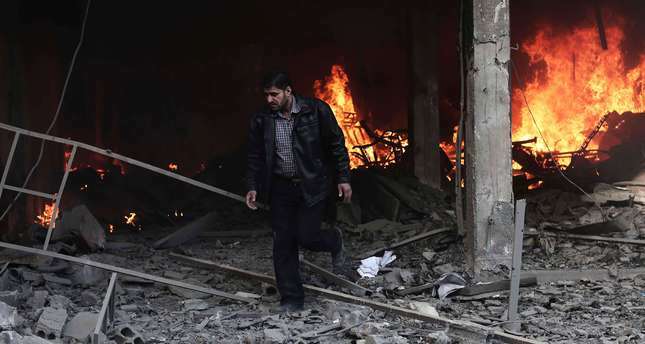 In recent weeks, however, the casualties have been overshadowed by the destruction in northwest Syria from Russian airstrikes propping up the Syrian military and supporting Iranian-Hezbollah-regime offensives. Seeking to clarify statements from last week, French Foreign Minister Laurent Fabius has said that President Assad can remain during a political transition, but must depart when it is completed. Fabius provoked controversy when he told a Parliamentary committee that the Syrian army could join countries such as France in the fight against the Islamic State. He soon clarified that the military co-operation was dependent on Assad’s departure from power. The fight against Daesh [Islamic State] is crucial, but it will only be totally effective if all the Syrian and regional forces are united…. A united Syria implies a political transition. That does not mean that Bashar Assad must leave even before the transition, but there must be assurances for the future. Turkish Prime Minister Recep Tayyip Erdoğan said on Saturday that Turkey, not Russia, suspended the “Turkish Stream” pipeline project. Russia’s Energy Minister Alexander Novak said on Thursday that Moscow suspended talks on the project in the wake of Turkey’s downing of a Russian warplane near the Turkish-Syrian border on November 24. Erdoğan, speaking at a meeting in Istanbul, said Novak’s remark was “lie”, as Turkey had suspended the project long before the plane incident because of Russia’s “non-compliance with our demands”. The Turkish Stream project planned four pipelines carrying Russian natural gas under the Black Sea, linking southern Russia to western Turkey. Moscow could thus deliver gas to Europe while bypassing Ukraine. The Russian energy firm Gazprom has spent $12-14 billion on the project and will now have to strand gas pipes worth $1.95 billion on the shores of the Black Sea. Erdoğan played down any threat to Turkey, which imports all its oil and gas, from the halt to the project. He said Ankara could fill any gap with supplies from countries such as Qatar and Azerbaijan.